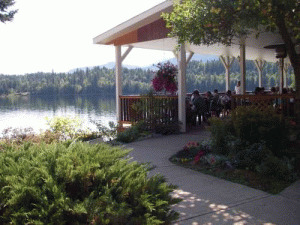 Located off of Highway #5 (the Yellowhead Hwy) in scenic Clearwater, BC, we invite you to come and relax in the tranquil beauty of the Dutch Lake Resort. Ideally situated approximately half-way between Edmonton, Alberta and Vancouver, BC. The Dutch Lake Resort should be included as a must stay destination for your next vacation. Cabins - Try something different! Vacation in your very own lakeside cabin. 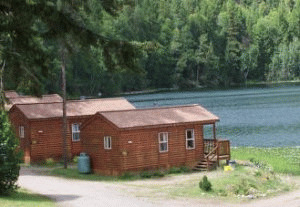 There is a fire pit and picnic table situated at each of the eight cabins for your enjoyment. RV/Camping - Easy Access... Whether you prefer a private, shaded site or a spacious sunny site, Dutch Lake Resort has it all. Our 65 RV/campsites range from full service sites to tent sites. We have excellent shower and washroom facilities as well as a Laundromat on site. Activities - Enjoy a leisurely drive to the waterfalls in scenic Wells Gray Park. Nearby golf courses, trail rides and excellent whitewater rafting along with some of the most spectacular scenery in Canada. If you are looking for trout, Clearwater is surrounded by the most scenic and fish-filled lakes in the area. The Painted Turtle - Our licensed restaurant on site offers a unique atmosphere. Enjoy the wildlife on Dutch Lake as you dine on the open-air sundeck. Please visit Dutch Lake Resort Website.